UMCP is a small city with up to 50,000 staff, students, residents and visitors occupying over 10,000,000 square feet of building space. This vast area is heated and much of it is air conditioned. Several thousand exterior security light poles and fixtures illuminate roadways, walkways and buildings across 1,400 acres, and tens of thousands of light and plumbing fixtures operate inside these buildings. Paying for What You Use... It all adds up! Did you know we pay higher rates for electricity you use on weekdays than on weekends? 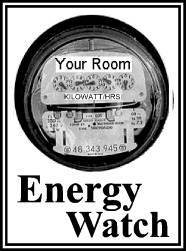 We are charged a higher kilowatt-hour rate by the local power company for electric consumption on weekdays during peak-demand periods 8 a.m. until 6 p.m.
We ask our housekeepers in our high rise buildings to switch off all hallway lighting during the day. Our residence hall renovation program in the 1980s refitted South Campus buildings with energy efficient thermal insulation, fluorescent lighting, and energy efficient windows. Unlike 21 of our 44 residence hall buildings that have their own generating equipment, 17 South Campus halls and six New Leonardtown apartment buildings draw their heat, hot water and air conditioning from three buildings called Satellite Central Utilities Buildings, or SCUBs. Energy is generated more efficiently and maintenance costs on the equipment are lowered when SCUBs are used. Through an aggressive campus-wide lighting retrofit initiative (combined with modest relamping programs we began in the 1980s), all of our incandescent lights in residence halls were converted to energy-efficient fluorescent fixtures. Even the old-style incandescent EXIT signs have been converted to efficient LED fixtures. When no one pays attention to how much energy is used and whether any of it can be saved, every one pays. Turn it off when you're not in!!! Turn off room lights, lamps, PCs, TVs, radios and all other equipment. Use a desk lamp with a fluorescent bulb when studying. If you live in a building with air conditioning, turn off the fan in the unit when no one is in the room. Okay, at a minimum, set it on low. Definitely turn your room's heater or air conditioner to low over weekends and during the semester recesses when no one is here. Conserve water by taking shorter showers. Where possible, adjust the water pressure downward. Keep sink faucets and shower fixtures from dripping and report those that do. Most hallway lights in residence halls (except Centreville Hall) can be switched off during daylight hours. Most lights can be turned off in lounges and bathrooms when the last person leaves since many of these spaces have one light fixture on at all times for safety. Air conditioners in study rooms and lounges can be turned off at night. Leave them in their Energy Conserve mode so they automatically shut off when the desired temperature is reached. Your heat convector has a control valve located under the front of the unit that can be opened (counterclockwise) and closed (clockwise) to alter the heat output. 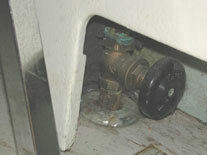 Learn to regulate the heat in your room using this valve, rather than opening and closing the window. In response to the prolonged drought conditions in the 1999 summer, Maryland's Governor Parris Glendening issued an executive order directing state agencies to conserve water, both during the crisis that lasted almost three months and through permanent modifications to various state facility's utility systems. An executive order in 2002 from the governor directed state agencies to achieve an overall 10% reduction in water consumption in state buildings by the Year 2010. Campus conservation measures began in 1998-99 with the installation of mandated water conserving shower heads, which reduced the rate of flow from between 4-6 gallons per minutes (gpm) to 2.5 gpm. While many prefer a "stronger flow" through shower heads, it is not attainable where water conserving shower heads have been installed. We are currently testing low-flow toilets and urinals and various locations to look for the control valve (called a flushometer) whose construction and maintenance requirements fit best into our residential environment.